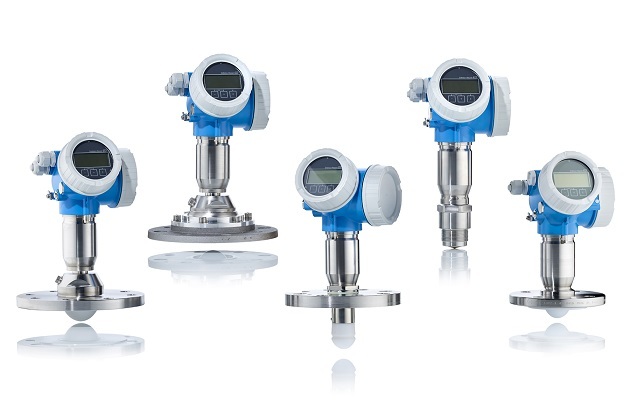 Endress+Hauser introduces the 80 GHz Micropilot FMR6x free space radar level instrument. Endress+Hauser introduces the 80 GHz Micropilot FMR6x free space radar level instrument for process applications. It is suitable for use in tanks or silos with complex geometries, obstacles, baffles, and/or nozzles. Its small beam angle of only three degrees provides level measurement at distances up to 410 feet with accuracy to ±1mm. Outputs include 4-20mA with HART and an optional open collector switch output or two 4-20mA outputs. The Micropilot FMR6x 80 GHz device features reduced tank wall effects, less interference from obstacles, and the ability to measure lower dielectric media. Its process connection, as small as ¾ in., allows for installation in tanks with small process connections, in tall nozzles, and through ball valves. The instrument’s antenna is designed to resist sticky buildup and condensation. Built-in mapping performs false echo suppression, easing commissioning. Developed in accordance with IEC 61508 and with international XP approvals, the FMR6x is suitable for use in SIL 2 and SIL 3 hazardous locations. Additionally, the FMR6x utilizes Heartbeat Technology for on demand verification without process interruption, Heartbeat SIL proof test complete with a proof test report, and Heartbeat Monitoring with fast and easy wizards for foam or buildup detection. If problems occur, the instrument provides standardized diagnostic messages developed according to NE 107 with clear instructions for action. Optionally, Heartbeat Technology can generate a verification protocol providing a report that may be required for compliance with regulations, laws and standards. The FMR6x has an integrated HistoROM data memory and management modules to enable fast and easy commissioning, maintenance, and diagnostics. Intuitive, menu-guided operating wizards at the instrument—via free DeviceCare or FTD compliant software, or remotely at the control system—reduce setup and field maintenance costs. The FMR6x is part of the FMR family of free space radar level sensors ranging from 1 to 80 GHz, all with Heartbeat Technology and HistoROM data memory.